Heat oven to 375°F. In large bowl, stir cookie mix, softened butter, flour and egg until soft dough forms. 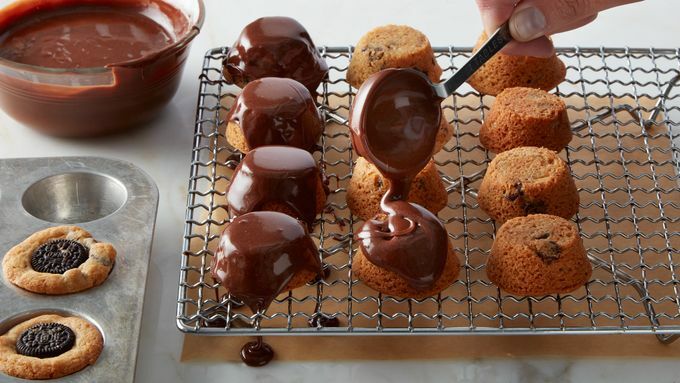 Shape into 36 (1 1/4-inch) balls; place in 36 ungreased mini muffin cups. 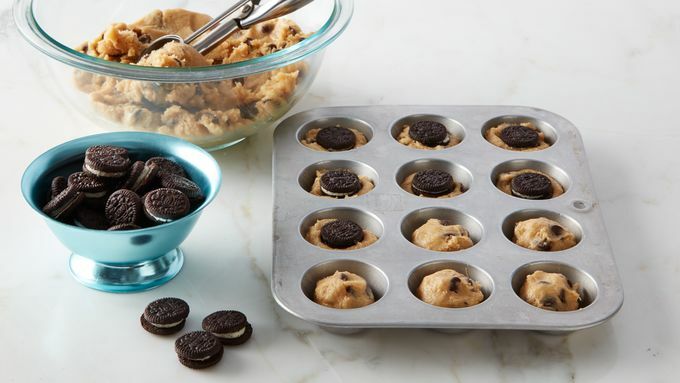 Press 1 OREO™ mini in center of each cookie. Bake 10 to 12 minutes or until edges are golden brown. Cool in pan 10 minutes. Carefully run small knife around outside edge of cookie to loosen; remove to cooling rack. Cool completely, about 30 minutes. 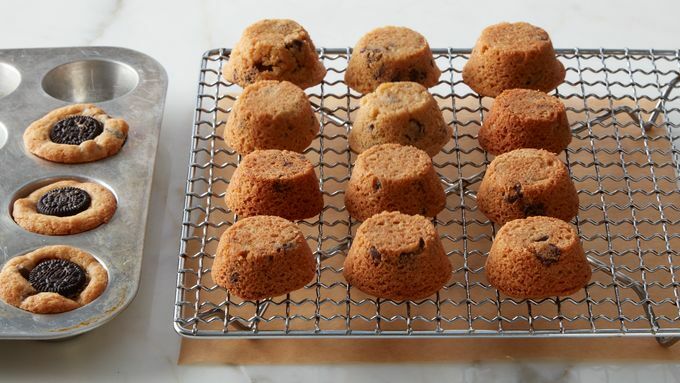 Place cooling rack of cookies over cookie sheet or waxed paper. Turn cookies over so bottom side is up and OREO™ mini side is down. In small microwavable bowl, microwave frosting uncovered on High 30 to 60 seconds or until thin enough to pour. Pour slightly less than 1 tablespoon warmed frosting over each cookie to completely cover, using spoon to help spread if needed. Rewarm frosting in microwave to maintain pouring consistency, if needed. In another small microwavable bowl, microwave white vanilla baking chips and shortening uncovered on High 30 to 60 seconds or until mixture can be stirred smooth. Drizzle melted white chips over cookies. Let stand about 4 hours or until frosting glaze is set. Store covered in airtight container at room temperature. If using 21-oz pouch Betty Crocker™ chocolate chip cookie mix, use 1/2 cup butter, softened, 2 tablespoons Gold Medal™ all-purpose flour, 1 egg and 1 tablespoon water; shape into 44 balls. 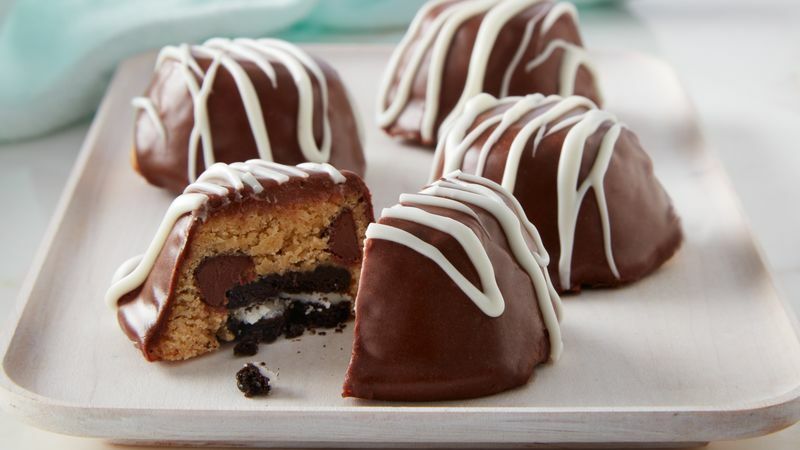 Use 44 OREO™ mini chocolate sandwich cookies to press in centers. 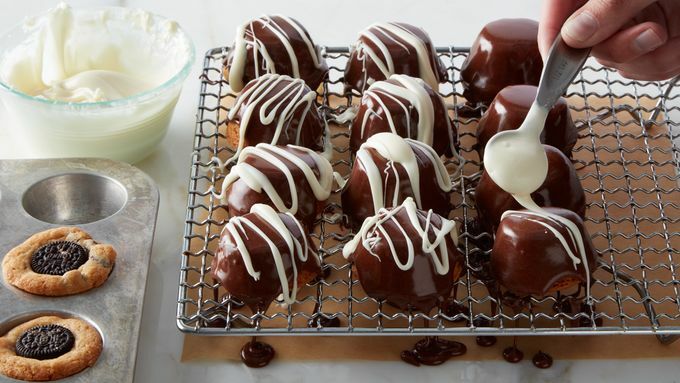 Use 2 cups frosting (from 2 containers Betty Crocker™ Rich & Creamy chocolate frosting). Makes 44 cookie bombs. Have only one mini muffin pan? Refrigerate the rest of the dough while baking the first batch. Cool the pan about 10 minutes, then bake the rest of the dough, adding 1 to 2 minutes to the bake time. For an easy garnish, crush 8 mini OREO™ cookies in a resealable food-storage plastic bag, and sprinkle over tops of cookies before frosting is set.